It’s National Burger Day on Thursday! To get you in the mood, here’s some burger-related trivia you can bust out to impress your colleagues while you chomp down on some patties + buns. 3. Although burgers started gaining popularity around 1904, cheeseburgers didn’t become a thing until the 1920s! 4. 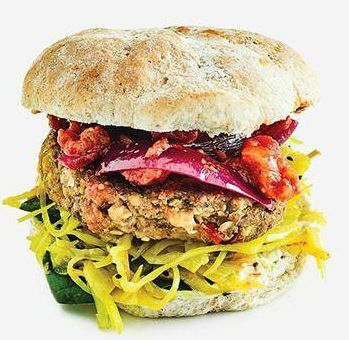 The veggie burger is said to have come much later – created by fellow Londoner and veggie foodie extraordinare Gregory Sams in 1982. 5. In 2000, Kim Jong Il said that he created the “Hamburger”. Sure ya did, buddy. 6. In 2009, Burger King ran a promotional campaign where customers could get a free Whopper if they unfriended 10 people on Facebook. Over 200,000 people were unfriended before the campaign was halted! 7. The most famous burger of all, The Big Mac, didn’t always have its iconic name. It was previously called “Aristocrat” and “Blue Ribbon Burger”. Both names were complete failures in the market, though. 8. To measure the purchasing power of a country, The Economist looks at how many Big Macs can be bought in that country with $50 USD. It is called The Big Mac Index.